The line one of the makers of the next Call of Duty uses about the series is that these games are movies we can play. This one will be a war thriller that hides a mystery. A few weeks ago in New York, Josh Olin, community manager fort team creating November's Call of Duty Black Ops showed me the game's Victor Charlie level and did his best to be cagey about the game's campaign. With Gamescom started in Germany, I'm now permitted by the game's creators to tell you what I saw, though I'd like to focus on the mysteriousness of the whole thing. There was some stuff that Olin showed me, that I could see and believe because it was in front of me. And then there was the stuff about which he was coy. In the confirmed category: The Victor Charlie occurs after your helicopter is shot down in or near Vietnam in the late 1960s. In Black Ops you are playing as elite cold war soldier (or soliders; it's unclear if you play as different protagonists.) Gunfire zips into your chopper. You get out and are in a jungle gunfight. Olin's got some skills, so he aimed for a killshot... cue a new effect, the game's camera hitching a ride on the bullet from his in-game rifle and, in slow-mo, into the enemy. That's the moment that prompted Olin to use that "movie you can play" line. 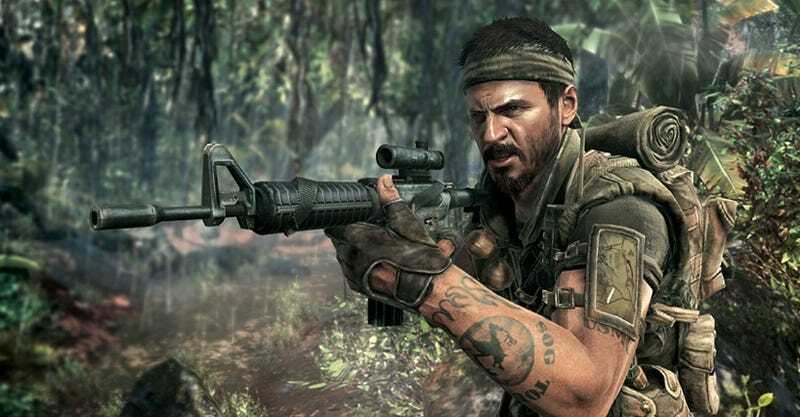 Black Ops runs on the visually impressive tech that has powered recent Modern Warfare and Call of Duty games, so the jungle battle Olin showed me looked terrific. Combat moved to some thatched-roof buildings, where many explosions were caused. I noticed that the game didn't include the signature yellow-star compass display that traditionally has pointed the player to their next goal in the series' more-or-less linear campaigns. Olin said that system didn't suit Black Ops, which is, more than other CoDs, a game about being part of a team. Instead of the star, I saw text on the screen doling out simple mission orders such as "clear area" or "follow" (the latter of which was pinned to an ally soldier). Olin transitioned into a tunnel sequence that had been shown briefly at E3 in June. His character crept through the darkened underground, making shadows flicker with a flashlight, sneaking up on some enemies for the kill. In the cagey category: The tunnel sequence, for some reason, made me think of how emotionally dark Treyarch's previous Call of Duty, 2008's World at War was. That game's campaign began with your American character facing torture at the hands of Japanese fighters in World War II and, in rare memorable instances, tested the player's moral compass. In one late level in Germany, for example, the player had the choice whether to slaughter German soldiers who had surrendered or to leave them captured. Olin would not confirm that Treyarch is doing more of that dark player-testing stuff. At my mention of moral choices, he became cagey, promising that the single-player campaign will reward players who go through it, that pieces that may feel disconnected will click at its conclusion. He expects gamers to have an "oh wow" epiphany by the time they finish the game. Naturally, he wasn't going to say what it is. He said we shouldn't expect Treyarch to divulge much more and that it is is important to Treyarch that single-player gamers have a "gripping" experience. That's also part of the reason, he explained, that the new game's campaign is single-player only. (Co-op is a separate mode, supporting two players on the same system or four players online.) This is not the standard way a solo campaign in a Call of Duty is described, but it seems fitting in a game about Black Ops. Our guys in Germany hope to have more time with Call of Duty Black Ops at Gamescom this week. Stay with Kotaku for more coverage from the big show. Black Ops will be out on all gaming consoles and PC on November 9.